Suitable for all your customers as the gravy is gluten free, suitable for vegetarians and meets UK Department of Health 2017 salt targets. KNORR Gravy Granules make a great tasting gluten free gravy to compliment your most popular dishes**. Quick and easy to prepare. Just add boiling water to the granules and simmer gravy for 30 seconds. No Allergens to Declare - this product does not contain allergenic ingredients which require declaration under EU regulation 1169/2011 (Annex II). *Kadence International: Gravy U&A. June 2016 n+305 UK Chefs. 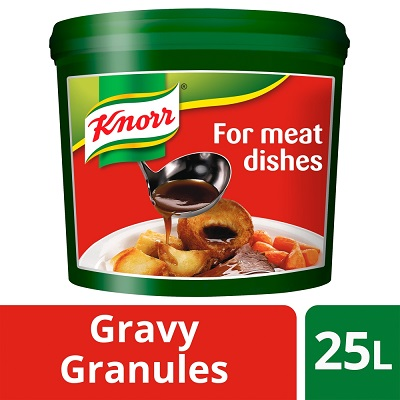 Knorr Gravy Granules make a great tasting meaty flavoured gravy to compliment your most popular dishes. It is gluten free, suitable for vegetarians and meets UK Department of Health 2017 salt targets. It is best suited with beef, all meats or for roast dinners. Quick and easy to prepare. Perfect with roast dinners. 1) Granules: 75g, Water: 1 litre. 2) Granules: Whole pack, Water: 25 litres. Add 75g to 1 litre of boiling water or roast pan juices and whisk for 30 seconds. Keep tub tightly closed. Store in a cool dry place, until best before end date. Try adding COLMAN'S wholegrain mustard into the gravy.